Hi all, I have managed to find a version of Zygor for Legion patch 7.2.5. The Zygor version that is compatible with 7.2.5 is 6.1.16524, released on August 23rd, 2017 but I have been unable to find this version. The Zygor version I have is 6.1.16452, note that this is not the latest version for 7.2.5 this was released on August 9th, 2017. The Zygor version I have is 6.1.16101, note that this is not the latest version for 7.2.5 this was released on June 16th, 2017. If you do manage to find a newer version please do let us know here. How do we know when Mods validate it? I would be very surprised if mods have the time to be validating addons. That would be a hugely time intensive task. If you have an older version of Zygor, you could find some software that scans for differences in files and validate the changes yourself. You could create a local git repo with the older version of zygor then overwrite with the new version I've listed and do a git diff to see what's changed. I'll keep this open in my torrent client in the hope that it will eventually download but it doesn't look like anyone is seeding it anymore. Thanks for this, where did you find it? Below is all wrong. It was not enough to simply change the expiry date, the Addon uses some sort of hashing or bitmasking to verify each and every guide. I was able to get it working by copying the license file from another version of the Addon and this time it survives more than one load. The download and VirusTotal links in the first post have been updated again. To stop the "License Expired" message showing up every time you log in or /reload, change Line 3 of License.lua to a ridiculously large number, eg. I've made this change and updated the download link in the first post. Tried hopping on but the lag was getting to me for now, so I didn't run the addons, but ty all for posting these. Going to use this one "6.1.16452: https://mega.nz/#!xFwgCaSJ!Re3VWyX4jMJ3hxo6fjyQiaDvSx9wKKHOIC62QP1XB8k - Thanks KiyoshiWOW". Is this the one where license expired is fixed? I love Zygor, and helps me alot when i freeze and don't know what to do. Great tool for many purposes. my opinion. "best to have latest"
Yes, that is the version I have been using and I uploaded the license fix. 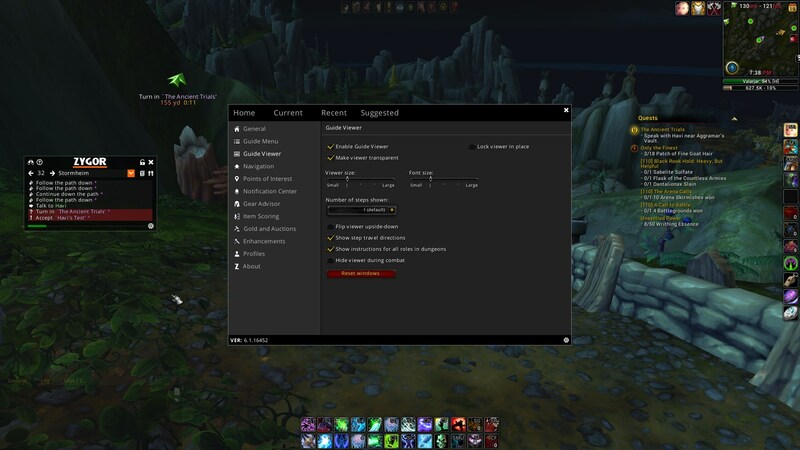 You get the occasional quest giver that is in the wrong place but between, common sense, the WoW-Freakz database, and Wowhead, you can generally figure out where to go. Alternatively, you might like to try 6.1.16566; again, I haven't tested this version yet but I'm going to try it out tonight when I get home from work.